Enterprise Domain Repository - Home - Open Source: EDR - Enterprise Domain Repository - Cantara Community Wiki for your Wiki! 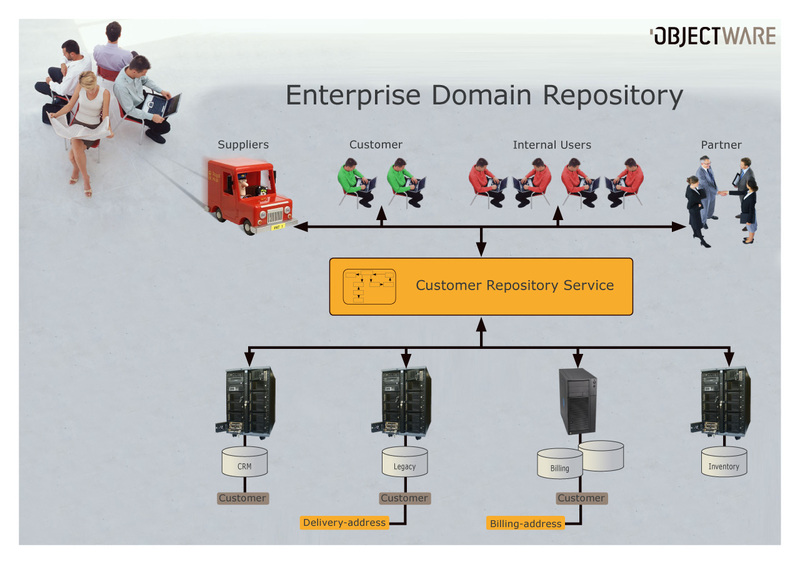 Enterprise Domain Repository (EDR) is a pattern for ensuring you are in control when handling Domain Objects containing data from multiple back-ends. Most enterprises have several systems which own parts of a domain object.The data from these systems might be disjoint, as well as overlapping. The data quality and SLA requirements for each system are often of diversified quality. We need a standardized way to handle multi-source domain objects, and to extend the Domain repository to handle the real-world CRUD of today's enterprises. The work on this pattern summarize experiences gained in real-life projects on both [.Net] and [Java]. The .Net examples will be made publicly available later. One of the advantages using EDR is the possibility of discovering, and automatically resolve, data inconsistency between different back-end systems. One example is that the same customer has different street address in your billing and CMS applications. This strategy is further examined in EDR-MDS . EDR data inconsistency between different back-end systems. "EDR - putting resources/data back as a first class citizen of your architecture"
I like the new communication. Many people still believe that DAO's are a first class citizen. We need to simplify the EDR message, and I think we must try this approach.